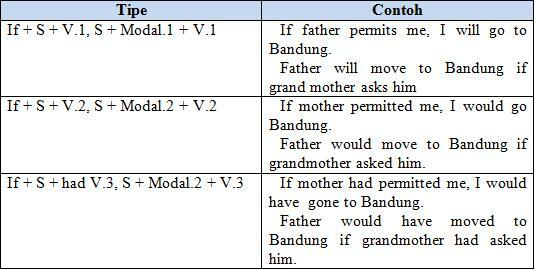 Kali ini saya ingin membahas tentang Tipe-Tipe Conditional Sentence dan 10 contohnya untuk masing-masing Tipe. Sebelum kita membahas Tipe dan contoh Conditional Sentence,Kita harus mengetahui pengertian nya terlebih dahulu. 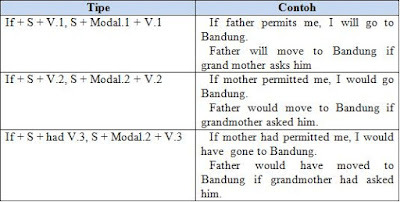 Pengertian Conditional sentence adalah complex sentence (kalimat majemuk) yang dibentuk dari subordinate clause yang diawali dengan subordinate conjunction if berupa condition (syarat) dan main clause berupa result/consequence (hasil). Future Possibility adalah masih ada kemungkinan pengandaian tersebut terjadi apabila syaratnya terpenuhi. dalam type 1 ini, chance nya 50:50 jadi belum ada fakta yang bisa disebutkan. Untuk membuat meaning / artinya selalu menggunakan simple future tense. Andi will leave the room if the teacher doesn’t come. Roy won’t be a doctor if he doesn’t pass the test. They will go to Borobudur temple if the planning runs well. If the volunteers do not come to help, the victims of the landslide will die. She will live with me if I am a rich man. The police will not come if noone calls them. The street rider will make a convoy if they get a letter permission. If the goverment do not raise the minimum payment, the national worker will do a demonstration. Type 2 atau biasa disebut present unreal adalah untuk mengandaikan kondisi yang tidak mungkin terjadi saat kita berbicara atau kondisinya berlawanan dengan apa yang ada saat ini. untuk menjelaskan meaning / faktanya selalu berlawanan dan menggunakan simple present tense. 1. If she didnt meet me, she would decide to suicide. fact: She meets me, so she doesn’t suicide. 2. I would be there now if she invited me to her wedding party. fact: She doesn’t invite me, so I am not there. 3. We would study abroad if we passed the final test. fact: we don’t pass the final exam. 4. If I had much money, she would marry me. fact: I don’t have much money, so she doesn’t marry me. 5. I would tell you the truth if I knew it. fact: I don’t know the truth. *Perlu diperhatikan untuk tobe / auxiliary dalam conditional sentence type 2 selalu menggunakan WERE apapun subject nya. 7. Would you come to my house warming party if she weren’t there? 8. She would never love him if he weren’t kindly hearted person. *Selain itu, dalam type 2, kata IF bisa dihilangkan, caranya dengan menghilangkan IF dan meletakkan WERE sebelum subject. 10. Were you at my home now, she would visit us. (you aren’t at my home, so she doesn’t visit us). Conditional Sentence type 3 ini digunakan untuk sebuah penyesalan di waktu lalu. Setiap dari kita tentunya mempunyai keingina yang tidak terpenuhi di waktu lalu. Fakta atau meaningnya selalu menggunakan simple past tense dan selalu berlawanan. 1. If we had passed the exam last year, we would have studied in UGM. fact: we didn’t pass the exam, so we didn’t study in UGM. 2. If she had got married with me last month, she would have been happy. fact: She was not happy, because she didn’t get married with me. 3. He wouldn’t have got an accident if he had driven the car carefully. fact: he got a car accident, because he didn’t drive carefully. 4. The horrible accident would have been avoided if the driver hadn’t been drunk. fact: the driver was drunk. 5. The fuel price wouldn’t have been arise if the president had had another smart solution. fact: the president didn’t have a smart solution. 6. If he hadn’t helped me, I would have been lost in Jakarta. 7. Would you have come here if you hadn’t known she was here? 8. If you hadn’t known the truth, you shouldn’t have spreaded the gossip. 9. Had you told her that you would marry her last year, she wouldn’t have been with him. fact: You didn’t tell her your intention, so she got married with him. 10. Anton would have punched you if she hadn’t told him to be calm down. fact: She advised him tobe calm down.